Each year we strive to treat our guests with an exclusive event filled with great food, amazing dancers & entertainment. This year, in 2018, we celebrate our 10th Anniversary supporting our cause. WOW!! Do we have some surprises in store for you!! Val Chmerkovskiy and Jenna Johnson with Kiki Nyemchek & Magda Fialek..........ALL from "Dancing With the Stars" and "SYTYCD". Ladies and gentelmen, tickets are limited. We will SELL OUT Quick, so don't wait! VIP meet & greet passes are included with GOLD Sponsored tables. See the Table Reservation Form below. Roses will be available again for purchase in remembrance of those lost and fighting Alzheimer's along with door prizes. Ladies, be ready to buy yourself a dance as we AUCTION off our professionals! 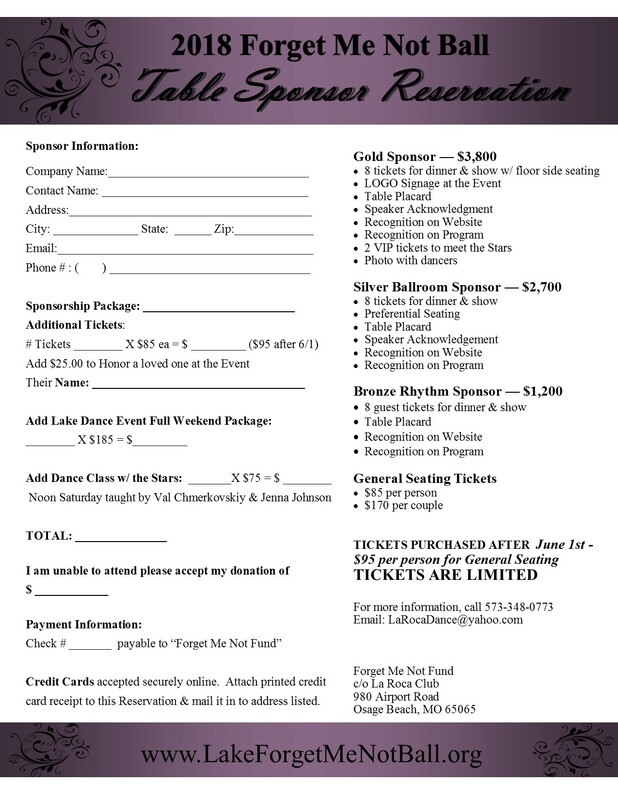 Tickets are $95 per person for General Seating ONLY to the Saturday night event. In the 'Gift Amount' field click OTHER. When the window comes up, enter the total amount for the amount of tickets you wish to purchase. For example: 1 ticket = $95, 2 tickets enter $190, 4 tickets enter $380, etc, If adding 'honor a loved one' add $25 to your total. Example: 2 tickets plus 1 loved one enter $215. In the 'Gift Frequency' field choose One-time gift. (If you want to sign up for a recurring monthly gift, you will need to do it in a separate transaction). Under 'Gift Designation' choose "Forget Me Not Fund" from the drop down menu. If you added a $25 donation to honor a loved one to your total, check the box for "Yes" then choose 'in memory of' and enter your loved ones name in the box next to it. You may choose to send a special message in the next section. Lastly, enter your billing information and payment type. For information on classes with the stars and to purchase the weekend pass, click here. **Questions please contact Amy at 573-348-0773.